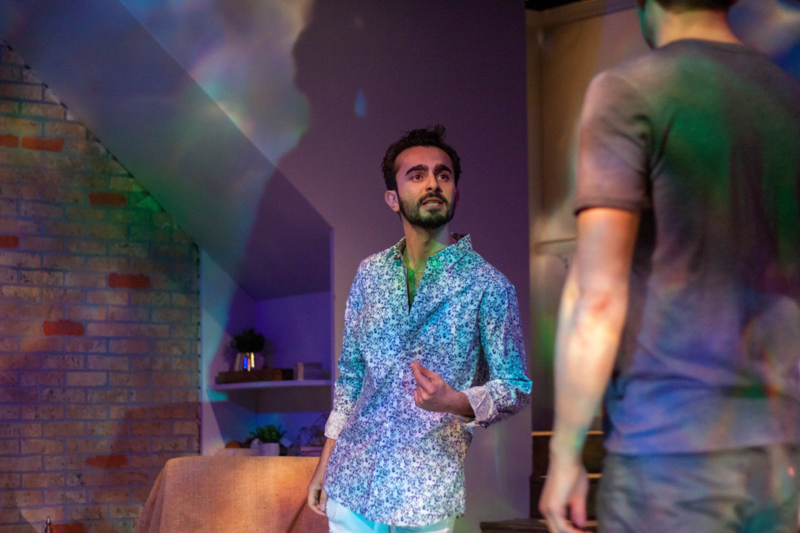 Set in Chicago, the play centers on the arrival of Razi Gol (Salar Ardebili) to his sister’s apartment in Uptown, right off of the Lawrence CTA Red Line. Soraya (Catherine Dildilian), Razi’s sister, has been in the United States for more than a decade after leaving her family in Shiraz, Iran to attend school and lives with her white Irish-American husband Chuck (Joshua K. Volkers). Razi, destitute, deeply traumatized by state violence in Iran and mourning a tremendous loss, arrives in Chicago just as bewildered and unbalanced as Williams’ Blanche DuBois. He is welcomed into his sister’s life and home, although not by Chuck. While trying to adjust to his new life, Razi is introduced to high-powered white lawyer Sean (Philip Winston) and the two begin a relationship. Tensions rise between Chuck and Razi and Soraya, as questions of cultural superiority and anti-immigrant rhetoric seep into the triangular dynamic. Underlying everything is Razi’s worsening mental health, and the choices he makes as a result. Through the Elevated Line, a new play by Novid Parsi, explores what it means to be unwelcome in the United States. Parsi performs what the show’s program calls a “conjuring” of Tennessee Williams’ A Streetcar Named Desire by replicating the dramatic structure of Williams’ work in the relationships between Soraya, Razi and Chuck. Through the Elevated Line operates within a framework where trauma, mental illness, queer sexuality and racial otherness are positioned as transgressions. It does not do much in the way of challenging this framework. Rather, it creates a spectacle of the pain and trauma of a brown gay immigrant man suffering from severe PTSD and depression. Much like Williams’ Blanche Dubois, Razi’s downward spiral forms the basis for the play’s central question and is the catalyst for dramatic action. The aim of this spectacle seems to be a motivational effort to inspire the audience to question their own political and social positions as they relate to the various identities that Razi inhabits. The play appeals to the humanity of the audience to recognize Razi’s humanity by relying on the spectacular portrayal of Razi’s emotional and physical trauma at the hands of white supremacy and U.S. imperialism. Salar Ardebili’s portrayal of Razi is masterful and truly heart wrenching, and the play delivers a devastating conclusion that is deeply affecting. While the play succeeds in demonstrating the brutality of the U.S. immigration system, I am deeply unsettled by the way it does so. The replication of acute racial trauma as an educational project carries the potential to limit the perception of the people it portrays. The representation of the pain and struggle that people of color in the United States endure on a daily basis has always been deeply fraught. I do not mean that Parsi or any playwright should not reflect the reality of the U.S. as it is. I only offer this question: do marginalized and brutalized people have to suffer and die on stage in order to convince audiences of their humanity? Parsi positions the audience away from the epicenter of Razi’s emotional turmoil, and explores how his pain and the choices he makes from within that pain affect the people around him. As part of that positioning, the play presents Chuck and Sean as receptacles for the question: “what would I do in their place?”, or perhaps more accurately, “would I do what they are doing?” I would argue to a certain extent that Soraya also invites that question. While Sean and Chuck represent two starkly different versions of patriarchal white-supremacy, Soraya’s presents a complicated narrative. Throughout the play Soraya is presented as an archetypal “good immigrant woman,” one who has succeeded at assimilating into U.S. society, in contrast to her brother, whose transgressions are ultimately punished. While the dynamics between these four characters successfully carries a sort of allegory of U.S. politics with regard to immigration, it also relies on Razi’s pain and anguish and the rejection of it to inspire sympathy, not empathy. Through the Elevated Line is an emotionally searing portrayal of the trials of immigration, homophobia, and racism. Its language, particularly the incorporation of the words and spirit of 14th century Sufi mystic and Persian poet Hafez, is genuinely moving and quite beautiful. Director Carin Silkaitis crafted a sharp performance, and guided skilled, talented actors through this difficult piece. Playwright Novid Parsi asks a great many important and salient questions in this work: What makes a good immigrant, and what makes a bad one? How do we respond to mental distress and addiction, especially in the context of people who have survived terrible trauma? What are the limits of our own compassion? Certainly the play asks these questions, but it does so without challenging the social and cultural narratives that surround and underpin them. Razi is never given a chance to heal, to be understood, and to do it on his own terms. While that may be the reality of someone in his position in this country, I cannot help but wonder how replicating that reality acutely on stage might narrow the chances for empathy if Razi’s life and perspective are not at the center.